Sigma Oil Industries Ltd has invites application from interested and qualified candidates. It is well known company in Bangladesh. 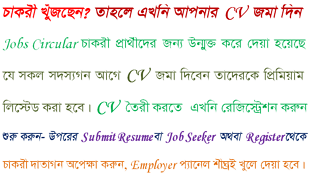 Recently they has been published a job circular for the post in Territory Manager (sales and Marketing), Executive/Sr. Executive (sales and Marketing). Ease logistics Company has published a circular. It is a well known Freight Forwarding and Logistics company in Bangladesh. Available jobs in Ease logistics Company. Oriental Oil Company has been published a job circular. They currently looking for dynamic, smart, self motivated, bright, competent for the following position Sales Manager (Retail), Sales Manager (Industrial), Sales Executive, Sales Engineer, Territory Sales officer. Fit Logistic Limited is a very popular and well known Group of company in Bangladesh. Candidates must be complete Bachelor/ Masters in any discipline. They offer attractive salary.